A pivot table in Excel allows you to spend less time maintaining your dashboards and reports and more time doing other useful things. 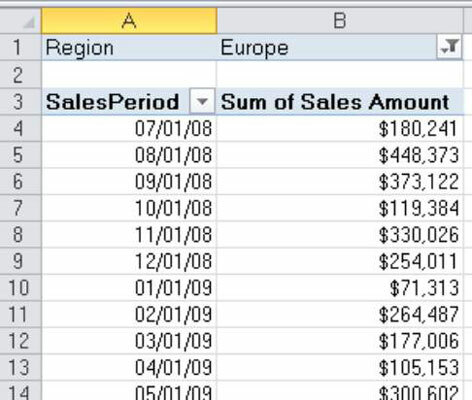 By default, your pivot table shows only data items that have data. This inherent behavior may cause unintended problems for your data analysis. 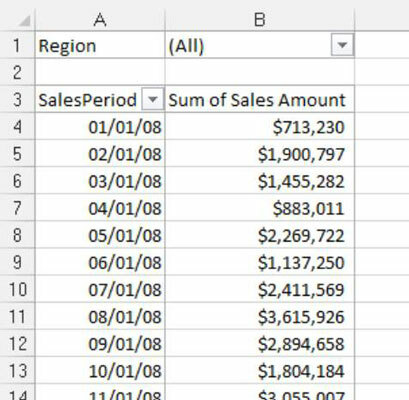 Look at this figure, which shows a pivot table with the SalesPeriod field in the row area and the Region field in the filter area. Note that the Region field is set to (All), and every sales period appears in the report. If you choose Europe in the filter area, only a portion of all the sales periods will show. See the figure. 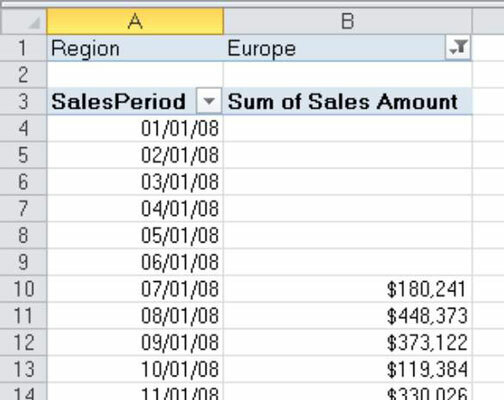 The pivot table will show only those sales periods that apply to the Europe region. Displaying only those items with data could cause trouble if you plan on using this pivot table as the feeder for your charts or other dashboard components. From a dashboarding-and-reporting perspective, it isn’t ideal if half the year’s data disappeared each time customers selected Europe. In this example, the target field is the SalesPeriod field. 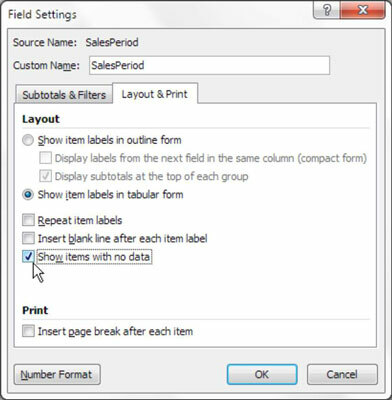 Select the Layout & Print tab in the Field Settings dialog box. Select the Show Items with No Data option, as shown in this figure. As you can see in this figure, after choosing the Show Items with No Data option, all the sales periods appear whether the selected region had sales that period or not. Now that you’re confident that the structure of the pivot table is locked, you can use it to feed charts and other components on your dashboard.